The 4th edition of three days Pakke Paga Hornbill Festival begins today at Seijosa in the bank of Pakke river in Pakke Kessang dist of Arunachal Pradesh. Arunachal Pradesh Deputy Chief Minister, Chowna Mein inaugurated the 4th edition of three days Pakke Paga Hornbill Festival today at Seijosa in the bank of Pakke river. Speaking at the inaugural function of the festival, Deputy Chief Minister, Chowna Mein said that the people of Pakke Kesang are an inspiration for others in the conservation of nature. He said that with this Wildlife conservation festival a message of love for mother nature and conservation of wildlife should be sent to the other parts of the State and such wildlife conservation awareness must be done in other areas too. He said that the wildlife species both flora and fauna across the world are getting extinct very rapidly. While referring to the study conducted by the Scientists of Center for Biological Diversity, the rate of extinction is as high as 1000 times greater than the natural rate of extinction due to destructive nature of human activities and climate change, he said. He further said that though the world has almost lost millions of wildlife species, Arunachal Pradesh is very fortunate to have a forest cover of about 82% of its total area and to be ranked among the 10th richest biodiversity hotspots of the world. He further stated that Arunachal can become the ultimate place for wildlife and cultural tourism while stating that with wildlife conservation, tourism flow would also increase. He called upon the people to make a commitment to protect the bounties of Mother Nature and conserve the wildlife species. He said that it is high time to take up conservation issue seriously and assured for a package for the preservation of the Wildlife Sanctuary of the State in the coming budget. He also asked the Chief Conservator of Forest for Wildlife & Biodiversity, Prabhat Tyagi to prepare and propose innovative schemes under wildlife conservation for incorporation in the next budget. 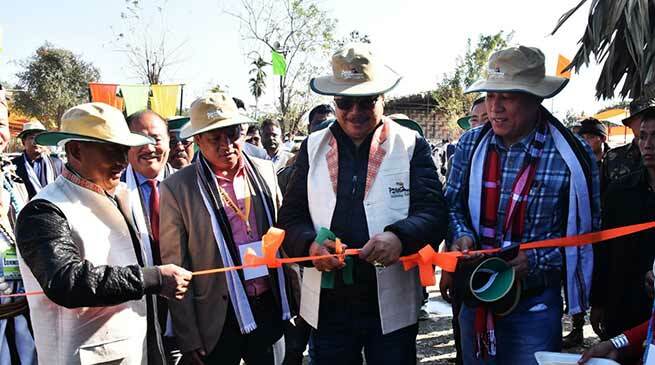 Minister of RWD, Parliamentary Affairs and IPR & P, Bamang Felix said that there is increased of the hornbill populations in the Pakke Tiger Reserve in the last three years after the festival has begun and lauded the local community for their conservation efforts. He vehemently discouraged hunting and also called for total abstinence from eating the wild meats in order to protect the wildlife species. He further called for planting of more trees. While encouraging the people in their conservation efforts, he provided financial assistance for planting trees in the Pakke Tiger Reserve and also for caring of the trees after planting. Pakke-Kessang MLA, Biyuram Waghe and Chairman, Pakke Paga Hornbill Festival Celebration Committee 2019, Takum Nabum also spoke on the occasion. The dignitaries also visited the exhibition stalls put up by various NGOs,, SHGs and Departments in the festival ground. Cultural items were also presented on the occasion. After the inaugural function, the dignitaries had a jungle safari inside the Pakke Tiger Reserve and spotted Wreathed Hornbills, Oriental Pied Hornbills and many bird species during their ride. The three days Pakke Paga Hornbill Festival will witness various adventure, tourism and sports activities besides workshop on organic dye, bamboo & coconut craft, organic farming, fashion show and cultural items.